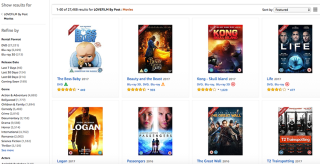 Amazon to close LoveFilm disc rental service | What Hi-Fi? Breaking news: streaming is big. So it’s hardly surprising that the LoveFilm disc rental postal service is finally admitting defeat in the face of the convenience and affordability of streaming - especially since its subscription cost soared in 2015. In the email, Amazon, which acquired the service in 2011, has openly attributed the decreasing demand for DVD and Blu-ray rental to the popularity of video streaming – something its own Prime Video service has played a part in. The streaming (and shopping) goliath will undoubtedly hope that subscribers will instead make use of its Prime Video streaming service. To that end, Amazon is offering LOVEFiLM By Post members a £15 discount on an Amazon Fire TV Stick (RRP £40) with a promotional code. Customers will not be billed for their LoveFilm subscription after 30th September 2017. LoveFilm was one of the first monthly 'all you can eat' media services, paving the way for the subscription model now used by the likes of Netflix and Spotify. And while sending discs through the post may seem archaic to many, the service remained popular with those who valued the breadth of the library and the reliable AV quality of DVDs and Blu-rays. Amazon Prime Video vx Netflix - which is better?